Want to take advantage of our big January Sale but unsure which model suits you best? Here, we take a closer look at each model in the range to help make your decision easier. The E-Shopper Electric Bike – Just £895! The E-Shopper is unlike all other models in our range. It has all the amazing features of our electric bikes and mopeds, but looks and feels like a bike to ride! The pedals and 250 watt electric motor allow you to switch between riding like a normal bike, and turning on the power for all the benefits of an electric bike. It has a range of 55 km and hits a top speed of 25 km/h. In addition, with wing mirrors, an LCD display and LED lights, the E-shopper not only feels fantastic to ride, it looks great too! The electric bike is in the same legal class as bicycles, meaning there’s no need for a license, insurance, tax or a helmet. As such, the E-shopper can be driven on UK roads by anybody over the age of 14! Available at a sale price of only £895 including delivery, you don’t want to miss out on this model! 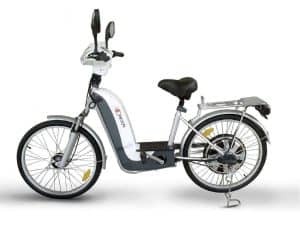 Featuring a graphite grey finish, a powerful 1500W motor and a removable 60V lithium battery, the Model 30 City is light, agile and ideal for riders without an external charging point. Specified with both sport and eco modes, this electric moped enables you to crank up the heat whenever you need to. The City does not require road tax, and costs only a penny per mile to run! The E-Rider Model 30 Moda Electric Moped combines a futuristic design with a top speed of 30mph and an ultra-smooth ride. Add this to front and rear LED lights, regenerative braking, passenger pillion points, a reverse gear and two USB charging points, and you get one of the coolest and functional electric mopeds on the market. Take a closer look at the Moda in our video! The Model 15 Electric Bike requires no registration, road tax or insurance – meaning you can hit the roads the moment your electric bike is delivered. With a top speed of 15mph, the Model 15 is road-legal and perfectly safe for anybody aged 14 and over – ideal if you have kids or relatives looking to get that first bit of independence. Featuring a sporty, all-black design with red finishing, the Rondo has a powerful 48vb lithium battery. The bike is operated through a simple to use twist-and-go accelerator, giving a top speed of around 15mph and a range of up to 25 miles from a single charge. It strikes an optimal balance between performance and comfort, and as with the Model 15 and Model 30 City, can be driven on UK roads by anybody aged 14 and over. All our electric bikes come with a two-year warranty, and are available with options to lease. This allows you to split the cost over monthly payments with the additional option to complete your purchase at the end of the lease period for a very small fee. Contact us today for any further information. Happy shopping!